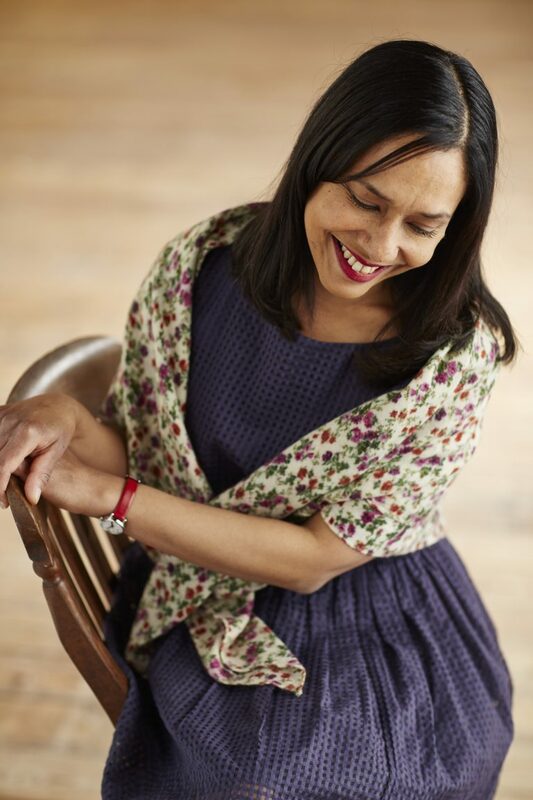 I first came across Dee Hardwicke and her beautiful designs through her work for Rowan Yarns – her glorious knitted heirloom floral quilt, her deliciously sweet floral cardigans, shawls and pullovers – but I soon realised that Dee is first and foremost an artist, drawing on diverse natural influences to inform her delightful designs across many media. 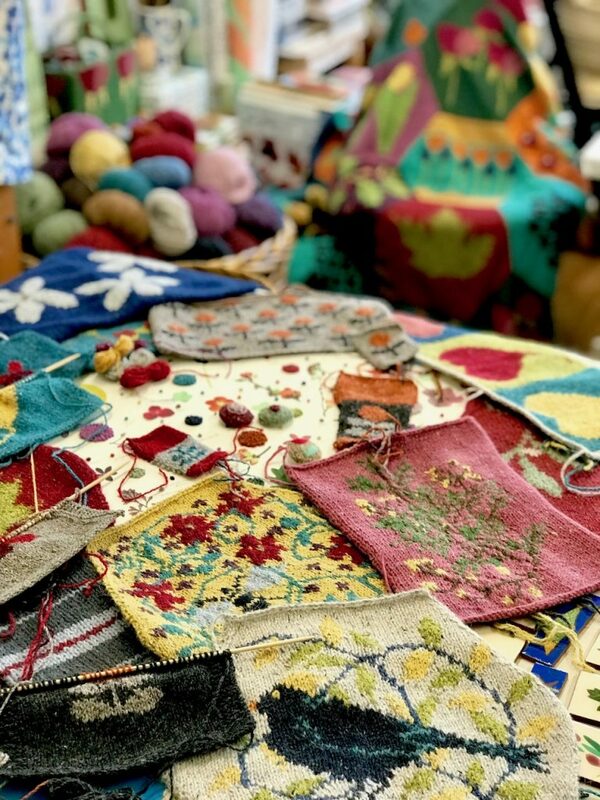 I caught up with her at the Knitting & Stitching show this autumn. Dee was still full of life and energy, despite having only just returned from an extensive tour of America, and completing a whirlwind of talks and workshops. 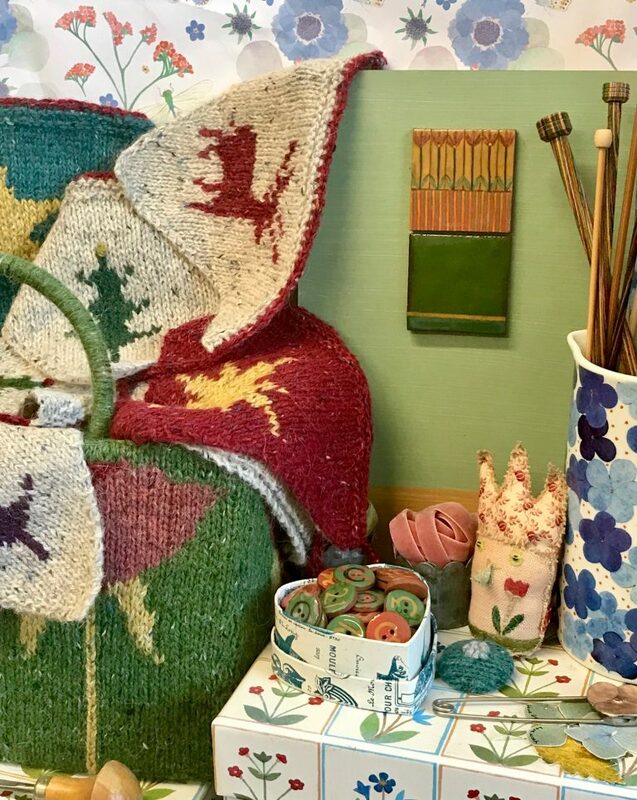 Knowing that Dee works across ceramics, textiles and print, I wondered how she first came to knitting. It turned out, a fascination with colour was at the centre of everything. 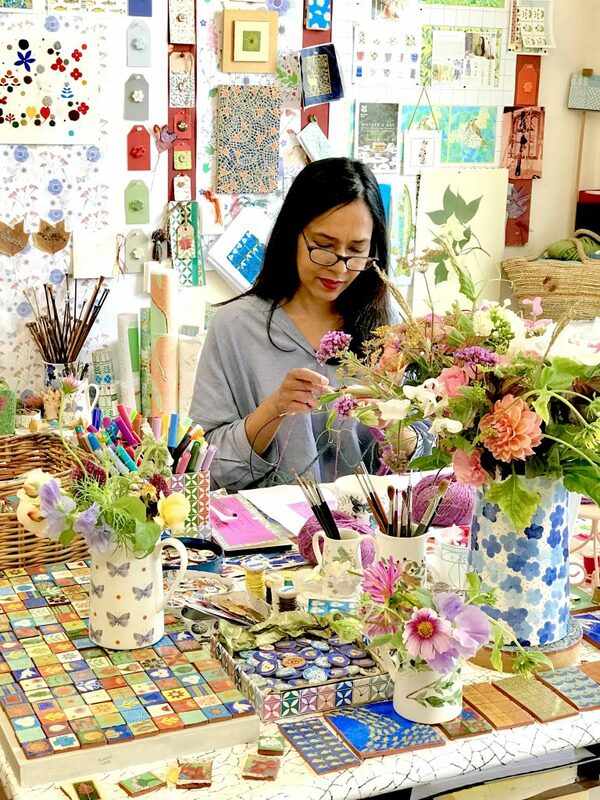 Although Dee continued playing with knitting, swatching and exploring texture and colour in her spare time, it was Fine Art, Ceramics and Sculpture that she went on to study at college. 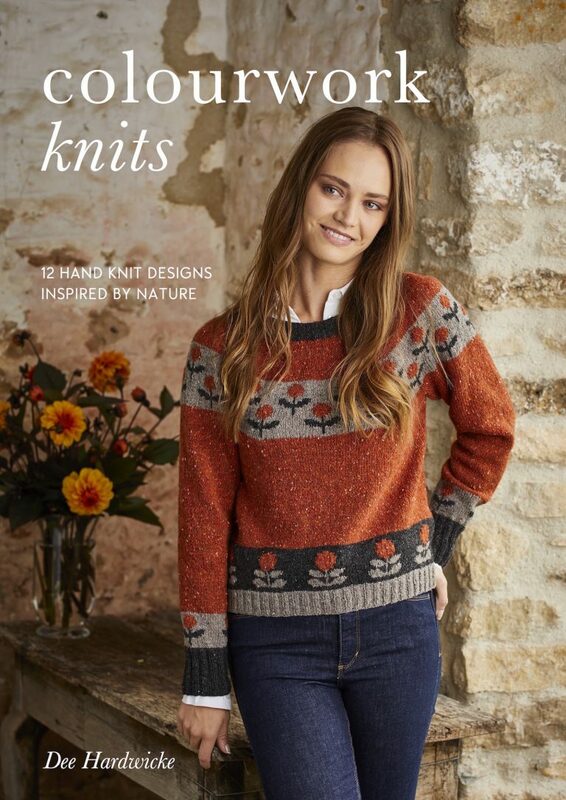 How did the venture into knitwear come about, I wondered? 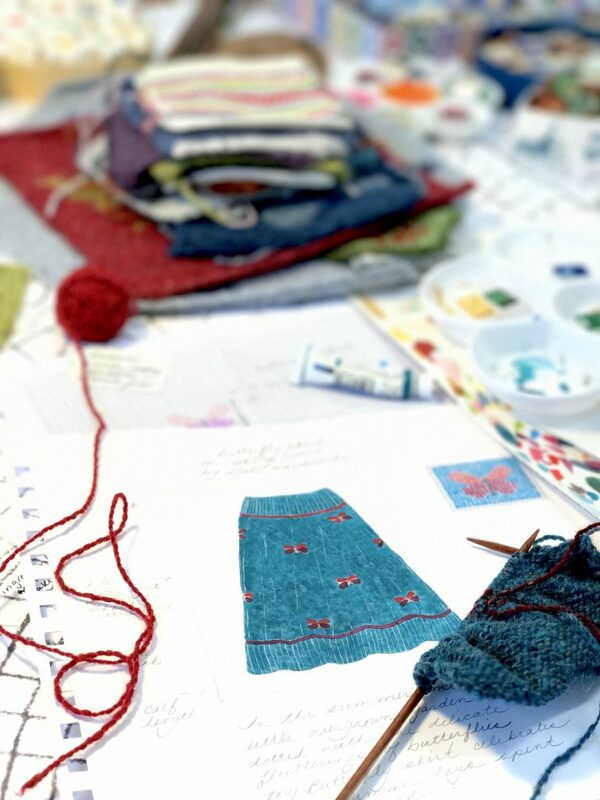 ‘I really felt passionate that my designs would work well in hand knit. 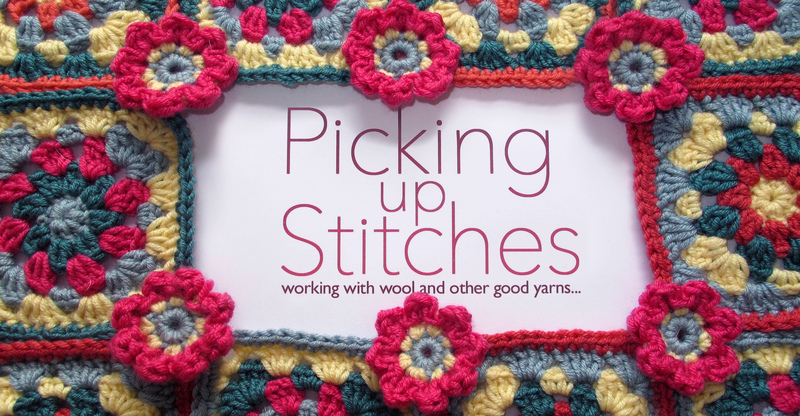 So I just phoned up my favourite yarn company and the moment was just right!’ Dee smiles. Why is it that Rowan is such a great company to work with?, I asked. 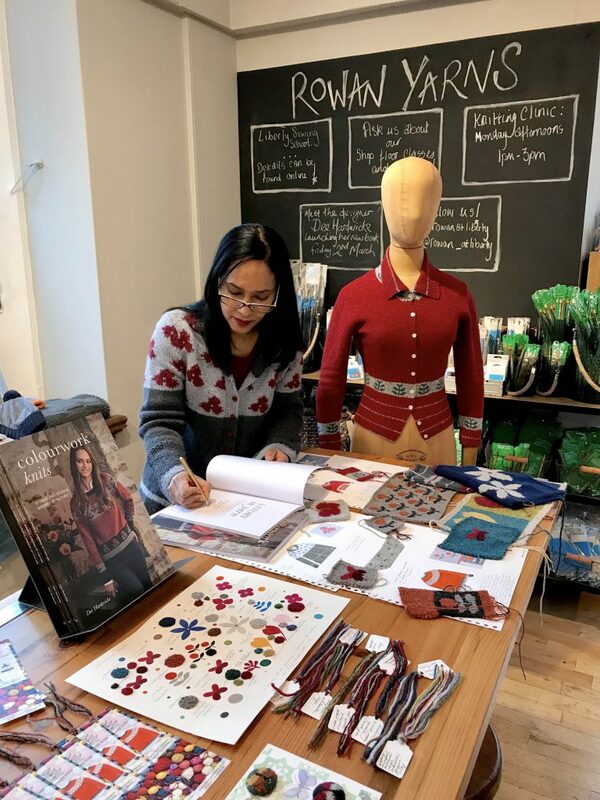 ‘Although they’re a large and successful company, they have a great vision, and David is really good at putting things together and celebrating what the designer puts forward in a way that best showcases the yarn. He just has a vision and gives you exactly the right project to get the best from you and the yarn. So given the fact that Dee works across many media, I wondered whether a particular inspiration tended to suggest a particular medium? ‘I see inspiration across a range of media, though sometimes a certain texture may suggest something specific like wood or ceramics. And Dee lives in a beautiful part of the UK, with plenty to inspire just outside the window. ‘I live in the Brecon Beacons and it’s utterly breathtakingly beautiful. Genteel and rugged at the same time – the textures, colours, beauty, storms and everything’s heightened. Yes, I definitely have a rich source of inspiration at home. And a specific yarn itself can be an inspiration too, according to Dee. ‘I suppose I really want to share the enthusiasm I have for art and design. In the workshops I’m aiming to open up the world of creativity to everyone as I believe we all have a creative soul inside us. 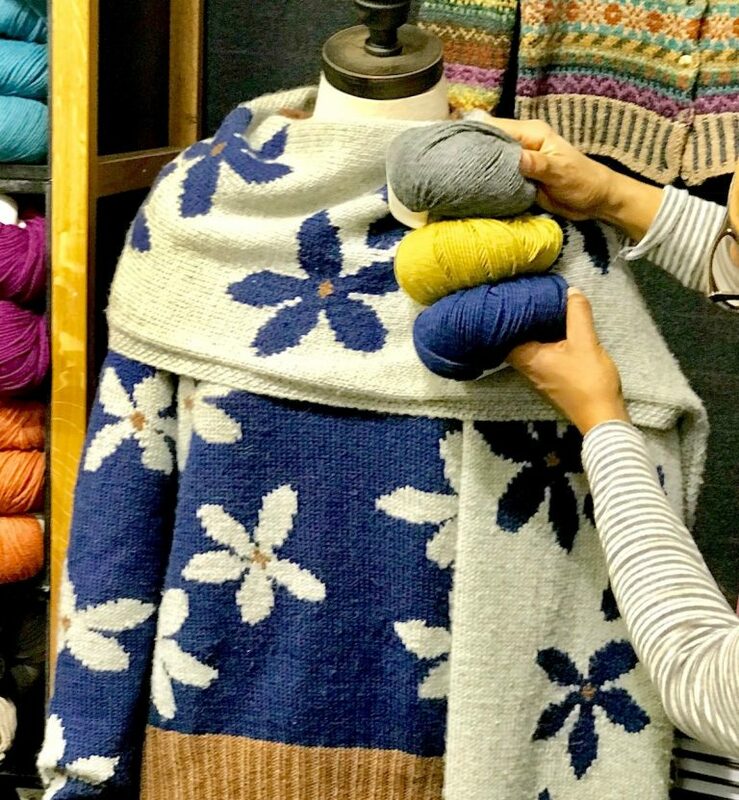 So when it comes to your own knitwear design, how do you go about approaching the design of a garment? I asked. ‘I paint the garment I’m imagining. Then I swatch decorative sections and chart anything decorative, working on it to get it to the exact scale. I work on the colour palette of yarn at the same time, produce schematic drawings, using the measurements from my size. 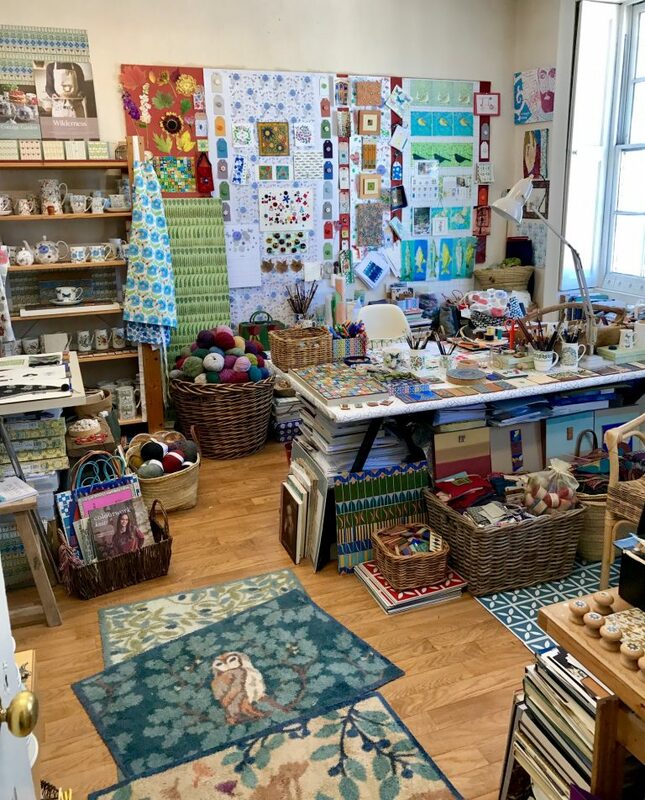 Finally, I asked, what do you knit for pleasure, and is there any advice you’d give to all those knitters out there? 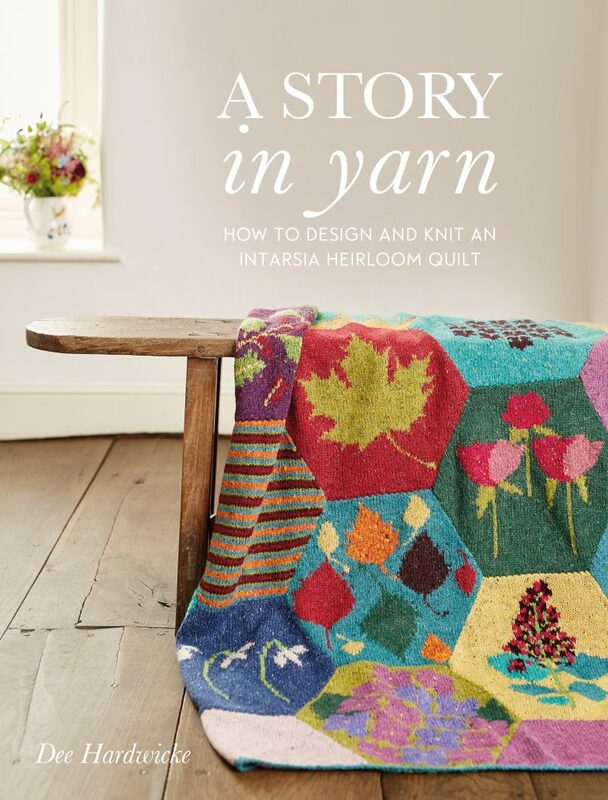 A Story In Yarn, teaches you how to go about creating your own spectacular heritage knitted quilt. 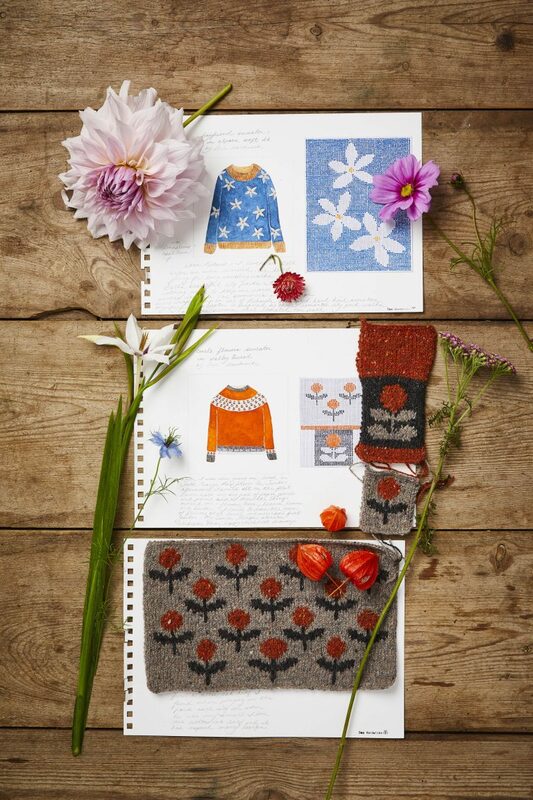 Colourworks Knits has patterns for some brilliant knitted garments featuring floral motifs. 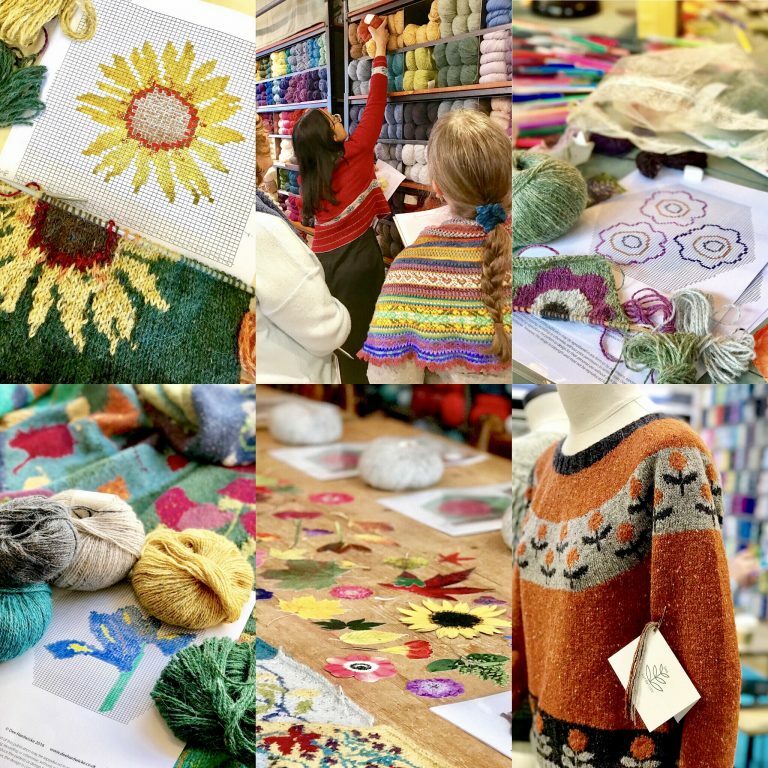 To read an interview with Martin Storey, knitwear designer, click here.